Fall once again has begun to make its appearance along the Alley. The days are getting shorter, nights cooler and some of the trees are starting to turn color. Lately, we have started to receive enough rain that some of the rivers are allowing fish to enter them. September is a month that depending on weather, I'll venture out. Generally the numbers of the fish can be low. But, the savvy steelheader can find a decent number of fish. In past years, its been either feast or famine. I go only when the water conditions are great. The first trip out didn't yield one fish due to muddy conditions and me forgetting to bring the spinning reel as the lake was perfect for casting spoons. Last week, I didn't go out due to coming home very late after the Ohio State game and still fighting the after effects of a cold. It didn't really matter because all of the streams were running low and clear. So far for September, I've been shut out. I awoke very early this morning sometime before five in the morning. The alarm blared and I looked up at the ceiling. In the dark and I could hear rain pelting the windows. I crawled out of bed and peeked outside. My Jeep glistened with water and it was lightly raining. The day before we received sufficient rainfall that raised the levels of some streams. The overnight temperature was in the 40s and it was going to be a cool day in the low 60s. I stumbled to the kitchen to my dismay I was out of coffee. I'm one of those people that can't function in the morning without a hot mug of java. I cooked my eggs and bacon and wolfed them down. I loaded the Jeep and drove to the gas station to fill up and get some of that raunchy gas station coffee. As I filled up, I watched several Browns fans walking in and getting ice and beer for the early morning tailgate. I thought to myself that I would rather have ice picks stuck in my balls than watch the Browns play. The Browns have been a joke from day one and 14 years later they still stink. But, I can relate to them as a long suffering Leafs fan and there's a possibility that there might not be any hockey this upcoming season. The pump popped loudly and I looked over at the total - $65.00, it was going to be an all event as I was going to get my money's worth. I hit the road as the rain pelted the windshield. I looked on my Iphone and the weather app showed a small band of rain coming off the lake. It was a quiet drive to Pennsylvania - no music, just the sounds of the tires on the road and my thoughts. I crossed into Pennsylvania and it was first light. The black clouds in the horizon were scattered and the roads wet. I drove down the road to the Elk Creek access and several cars ahead turn into it. It was seven when I entered and I could see a lot of cars. The first lot was packed and I was forced to parked in the second one. This is what the steelheader expects in late September on the Elk. Fishing the access is a test in patience and playing well with others. Those two attributes are ones that at times, I fail miserably. It was put on my happy face and I wondered how long it would take me before I blew my stack. I geared up and walked down to the creek to see a mass of humanity. The log jam had about 15 guys fishing and others were forced to fished farther down patiently waiting for a better spot. I looked farther upstream and there were more people fishing. The water up there was very shallow and my gut told me to fish lower in the deeper slower moving water. I crossed over and there were anglers sitting on the wall and others on the opposite side. I walked down around the bend and there were more people scattered on both sides. I found one spot on the opposite side of the shale bank and I shuffled in. Several large trees hung over the creek and fishing on that side was difficult due to the branches. It was a mix of fly and bait fishermen and not a lot was happening. It was quiet as people focused intently on their floats and indicators. In the distance I could hear the roar of the waves crashing on the shore. There wasn't a lot of chatter and not too many happy faces. The water felt cool and somewhere in the murky depths were steelhead. Once in a while a fish would announce its presence by rolling or jumping clear out of the water. I had a couple jars of clear water and flash cured eggs and I hoped they were up to the task as they spent the entire summer hidden way back in the depths of the fridge. I worked my small section and once in a while the mundane morning was broken by the sound of fish being hooked. Nobody was hammering them and no particular spot was yielding fish. Just as fast as the action was, it quickly went back to quiet and unassuming. I kept making adjustments and at one point I tied on a white jig. For two hours I didn't get nothing and I started getting cold. I dressed for early fall, a tee shirt under a long sleeve shirt and I wore a flimsy fleece jacket. I shivered as I tried to concentrate. I went back to sacs and finally redemption. I watched the float tapped a couple of times and I set the hook. 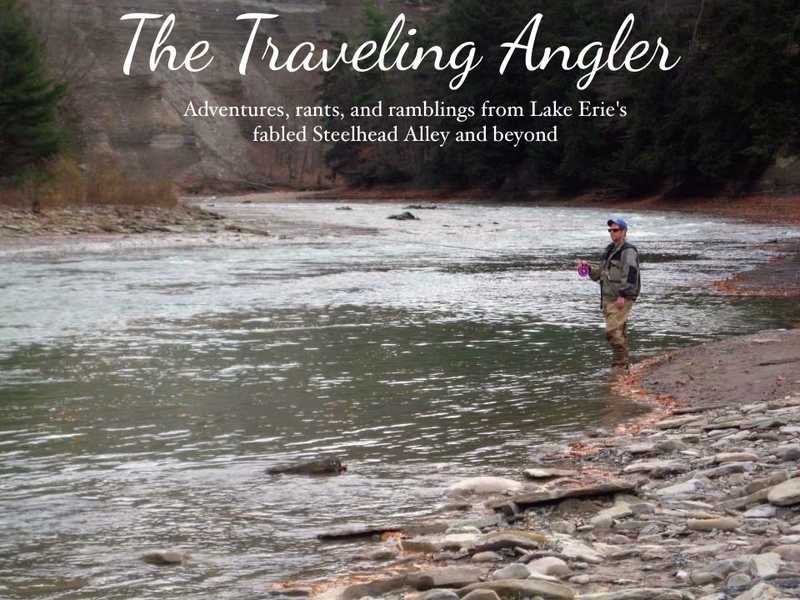 The rod throbbed and I felt that tell tale powerful surge of a steelhead. It was a powerful quick intense fight and I landed the first fish of the season - a chunky bright silver male. I beached it in the mud and quickly took the hook out. I watched the fish quickly dart back into the murky depths. The first fish of the new season made the cold feel more bearable. It briefly rained and several anglers started to depart with their catches. That opened up more space for me to even pull off some hero drifts, which is unheard of on the lower Elk. The same pattern played out all morning 2 and 3 fish caught. Thankfully the sun started to come out and I felt the rays. My body started to warm up and I felt rejuvenated. I ended up with 2 more fish and by then it was early afternoon and the fish shut off. More and more anglers, especially the ones who didn't sniff one bite packed up with disappointment. The place started to clear and I too made my way out. The log jam was down to 5 guys however all of them were tightly clustered. I survived the access for another day. Remarkably everybody got along. There wasn't f bombs hurls, cut lines, and fellow anglers pummeling one another. We'll see what happens the next time I venture out to Pennsylvania.